25 miles on bike on the Lehigh Gorge Trail (a rails to trails effort) from White Haven, Pennsylvania to Jim Thorpe, Pennsylvania makes this man hungry and thirsty. Off to the balcony at the Inn at Jim Thorpe for pizza and…hmm…what should I drink? Why beer of course. 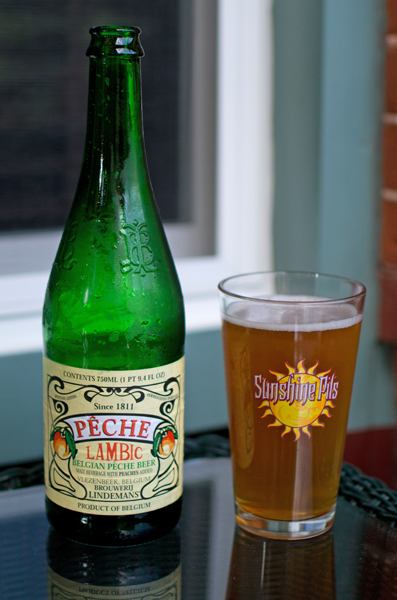 Beer #194 is Lindemans Peche by Brouwerij Lindemans from Belgium. 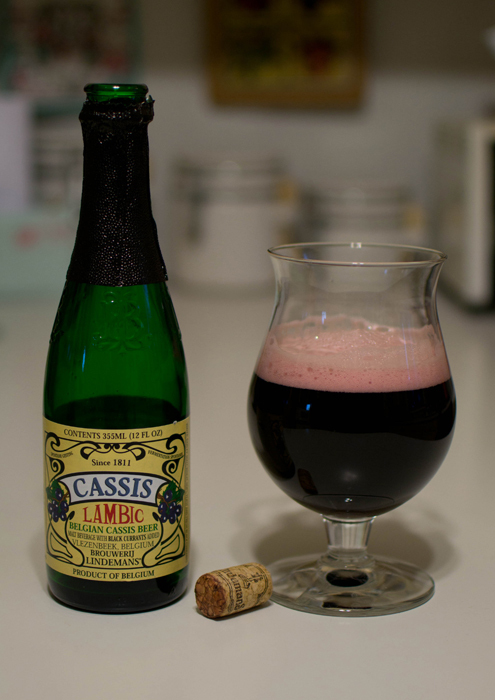 Beer #86 is Lindemans Cassis by Brouwerij Lindemans. This is my first Fruit Lambic so I am looking forward to this. A Lambic is a unique style of beer only brewed in the Pajottenland region of Belgium that is spontaneously fermented, this particular version is brewed with fruit. The ABV of this Lambic is 4%. It poured into the tulip glass a very dark purple with a light purple or pink head. The appearance strongly reminded me of grape juice. It had a concord grape like aroma, probably the black currants (never tasted or smelled them before) along with an earthy aroma. It tasted to me like carbonated grape juice, nice and tart and a bit sour too. It was a tad bit thick with very fine carbonation. This was a refreshing beer very easy to drink. This was another my wife really enjoyed. I thought it was quite good too. If you like grape juice, the dark variety, I don’t see how you couldn’t enjoy this. Looks like I can add another style of beer to my likes list, Lambics for the win!